Thomas Dunne Books, 9781250014221, 227pp. OFF THE LEASH is a group portrait of dog people, specifically the strange, wonderful, neurotic, and eccentric dog people who gather at Amory Park, overlooking Boston near Fenway Park. And it's about author Matthew Gilbert's transformation, after much fear and loathing of dogs and social groups, into one of those dog people with fur on their jackets, squeaky toys in their hands, and biscuits in their pockets. Gilbert, longtime TV critic at The Boston Globe, describes his reluctant trip into the dog park subculture, as the first-time owner of a stubbornly social Yellow Lab puppy named Toby. Like many Americans, he was happily accustomed to the safe distance of TV viewing and cell-phone web surfing, tethered to the digital leash. But the headstrong, play-obsessed Toby pulls him to Amory, and Amory becomes an exhilarating dose of presence for him. The joyous chaos of wrestling dogs and the park's cast of offbeat dog owners - the "pack of freaks" - gradually draw him into the here and now. At the dog park, the dog owners go off the leash, too. Dog-park life can be tense. When dogs fight, their owners - such as the reckless Charlotte - bare their teeth at each other, too. Amid the rollicking dog play, feelings tend to surface faster, unedited. But Gilbert shows how Amory is an idyllic microcosm, too, the home of enduring friendships and, as the droll but vulnerable Hayley knows, romantic crushes. Meeting daily, a gathering of dog owners can be like group therapy, or The Office, or a standup concert. As a TV critic, Matthew Gilbert is well-known by his readership for his humorous and wry writing style. 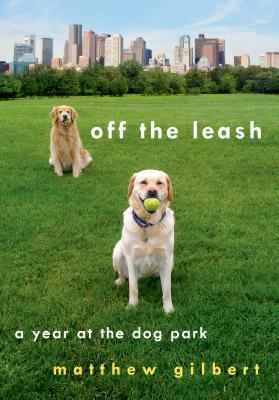 A charming narrative that will appeal to anyone who has ever enjoyed watching a puppy scamper through a park, OFF THE LEASH is a paean to dog lovers and their pets everywhere, perfect for fans of Marley & Me and Merle's Door. Matthew Gilbert is the TV critic at The Boston Globe, where he also covered books and movies. He has written for Slate, served as the managing editor of Boston Review, and clerked at Harvard Book Store. He lives in Brookline, Mass., and Off the Leash is his first book.